One of the promises that helped candidate Donald Trump become President Donald Trump was that he was going to bring back America’s manufacturing and energy industries, especially the coal mining industry devastated by Barack Obama’s corrupt green energy policies. Democrats, and some establishment Republicans, dismissed the idea as fantasy or a cynical political ploy playing on the fears of people desperate to regain a lost way of life. But the most recent economic and employment figures for the coal mining industry show President Trump’s Executive Order on energy and his broader policy guidance to EPA to return to a rational and lawful regulatory regime is in fact bringing back both coal production and employment. As our friend, Stephen Moore, pointed out in a recent article for Breitbart, the latest jobs report says that 8,000 more mining jobs were added in April. That brings the grand total to more than 40,000 new mining jobs since the election of Donald J. Trump. “Does this sound like an industry in decline?” asked Moore. And Reuters economics writer John Kemp says U.S. coal producers can look forward to an increase in production and jobs during 2017 and 2018. During Obama’s war on coal, US coal production slumped from 1 billion tons in 2014 to just 739 million tons in 2016, according to the U.S. Mine Safety and Health Administration. The average number of operators and contractors employed at the coal mines (excluding office staff) fell from 111,000 in 2014 to just 78,000 in 2016 reports Kemp. Last September, according to FOX News, the number of people mining coal hit the lowest point since 1985. * January 2017 production: 69499.838 thousand short tons vs. January 2016 production of 60499.695 thousand short tons. * February 2017 production: 65410.527 thousand short tons vs. February 2016 production of 57263.177 thousand short tons. * March 2017 production: 64798.726 thousand short tons vs. March 2016 production of 55264.828 thousand short tons. 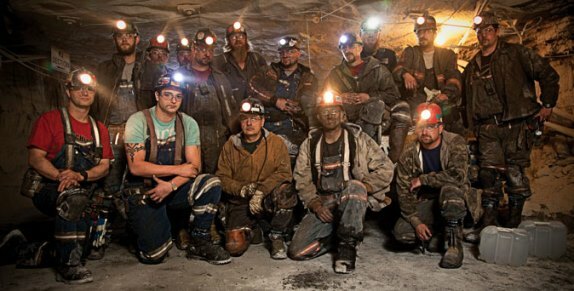 In Beckley, West Virginia WSAZ reported that there are new signs of life in the coal industry as a couple companies in West Virginia are looking to fill numerous openings for underground coal miners through a job fair. The job fair was hosted at the Country Inn & Suites in Beckley where Panther Creek Mining and Blue Creek Mining sought to fill several positions such as production supervisor, electrician, fireboss, equipment operator, and general laborer. The companies will also be hiring for other positions reported WSAZ. WVVA multimedia journalist Annie Moore reports that Blackhawk Mining Human Resources Officer Samantha Owens said coal market conditions have improved significantly, even allowing her company to hire first time miners. "It is definitely picking up and getting better. We've even hired inexperienced miners at several of our operations." For miner Chad Smith, the reduced restrictions on coal implemented by President Trump and the rebounding market have also brought a renewed sense of hope. "Since Trump has come back into office, I've gotten back in the mines. Trump has done more for coal in a week than Obama did in an 8-year term," said Mr. Smith. *All figures U.S. Energy Information Administration unless otherwise indicated.